SHANGHAI (AP) — President Xi Jinping promised Monday to open China’s growing consumer market wider at an import fair meant to help defuse complaints Beijing abuses the global trading system. But he offered no response to U.S. and European complaints about technology policy and investment curbs. The China International Import Expo is part of efforts to develop China-centered trading networks while resisting pressure to roll back industry plans that Washington, Europe, Japan and other governments say violate its market-opening obligations. “It is our sincere commitment to open the Chinese market,” Xi said in a speech to a VIP audience that included Russian Prime Minister Dmitry Medvedev. Xi promised to cut costs for importers and improve consumer spending power to help boost imports. Some 3,600 companies from 152 countries selling everything from Egyptian dates to German factory machinery are attending the five-day event at a cavernous convention center that bills itself as one of the world’s biggest buildings. Prime ministers and other senior officials of governments including Egypt, Pakistan and Vietnam also were attending the fair. The United States – China’s biggest trading partner – did not send a high-level envoy. Xi’s government is emphasizing the promise of a growing consumer market of 1.4 billion people to help deflect complaints that it subsidizes fledgling technology suppliers and shields them from competition. Business groups say China still hampers access to industries including finance and logistics. They say regulators are trying to squeeze foreign competitors out of promising fields such as information security. Xi promised steps that might address such complaints if carried out, including easing restrictions on foreign competitors in finance, education, telecoms and health care. He gave no details or a timetable but said the ruling party already was carrying out changes promised over the past year. Businesspeople and economists welcomed the promises but said Beijing needs to act promptly to dispel concern about the cooling, state-dominated economy. 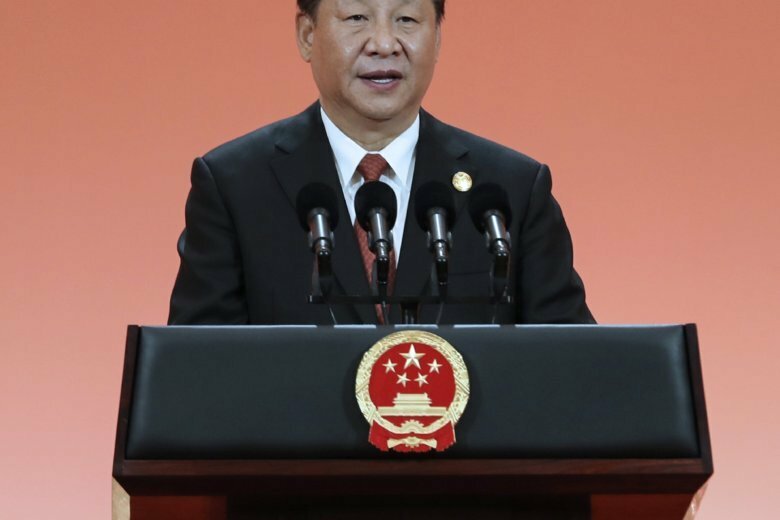 The ruling Communist Party is trying to restore public confidence after economic growth sank to a post-global crisis low of 6.5 percent over a year earlier in the last quarter. The country’s stock market has sunk 25 percent this year, becoming the world’s worst performer. Xi acknowledged some Chinese industries face “growing risks” but said efforts to shore up growth are already paying off. China’s $12 trillion-a-year economy is “a sea, not a small pond” and can withstand shocks, he said. China has cut tariffs and announced other measures this year to boost imports, which rose 15.9 percent in 2017 to $1.8 trillion. But none addresses U.S. complaints that prompted Trump to impose penalty tariffs of up to 25 percent on $250 billion of Chinese imports. Beijing has responded with tariff hikes on $110 billion of American goods. The fair lets Beijing show it is “making efforts to boost imports,” said Rajiv Biswas, chief Asia economist for IHS Markit. But a deal with Washington “will require significant measures by authorities to reduce bilateral trade imbalances and to protect U.S. intellectual property rights,” he said. Chinese leaders have rejected pressure to scale back plans such as “Made in China 2025,” which calls for state-led creation of global champions in robotics and other fields that might challenge U.S. industrial leadership. Last week, Trump and Xi had what China’s foreign ministry called an “extremely positive” phone conversation. They plan to meet during this month’s Group of 20 gathering of major economies in Argentina, but private sector analysts say a breakthrough is unlikely. Already the No. 1 market for its Asian neighbors, China is promoting its “Belt and Road” initiative to expand commerce by building ports, railways and other infrastructure across 65 countries from the South Pacific through Asia to Europe and Africa. The Shanghai expo also gives Beijing a chance to repair its image as a positive force for global development following complaints that “Belt and Road” projects leave host countries with too much debt, with too little work going to local companies. Exhibitors at the event included U.S. automakers and technology suppliers European pharmaceutical and clothing brands, African tea exporters and Japanese electronics manufacturers. At a stand for Nicolas Correa SA, a Spanish maker of factory equipment, salesman Carl Che showed potential customers a milling machine the size of a bus that can cost 1 million to 5 million euros ($1.2 million to 6 million). Che said Chinese manufacturers of wind turbines, aircraft and nuclear power equipment have bought 406 of the machines since 2003 and the company is looking to expand to food, health and other industries. The China agent for Metal Shark Boats, a New Orleans-based builder of heavy-duty vessels for law enforcement and fire agencies, had two 13-meter-long (40-foot-long) patrol boats sitting in metal cradles. It has sold five boats to China’s customs agency and is marketing itself to environmental and other regulators, said Sherman Ge, chairman of Shanghai-based Breeze Tech. The expo also highlights the blurring of lines between Chinese and foreign industry as China’s companies expand abroad. Exhibitors promoting imports into China included Sweden’s Volvo Cars, a unit of Chinese automaker Geely Holding; General Electric Appliances, part of China’s Haier Group in 2016, and California-based solar supplier MiaSole, part of Beijing-based Hanergy Group.